I need to iron out my floorplan this week. I have two young kids and am looking for a floorplan that has two forward facing seats (captain chairs or couch) and is able to sleep four and has a bathroom. This is the only configuration I could come up with that works. My concerns that some others brought up on another thread are ride quality in the back and communication with the kids that far away. Anyone have experience with ride quality on couch in rear position in a 2500 4x4 170. One of the "favorite" floorplans has this configuration with couch in back. I drive a lot at night when kids are asleep. They also watch movies while driving. Any feedback or alternate floorplans are greatly appreciated. Thanks! The thing you learn fast with Class B's is that they are an exercise in compromises. Your floorpan would work to sleep 4 but comes at a big price with very limited storage space. You aren't going to have hardly any storage space except in the upper cabinets. I was surprised on my floorpan that the space under the seats, couches and ottomans quickly filled with water tanks, batteries, inverters, furnaces, etc.. There ended up being virtually no storage space there at all. I would think about where you are going to put bedding, clothing, dishes, and food for 4 along with all the other things you need to travel with. What are you going to do with the extension cushions when you aren't using them. Young kids also don't stay young very long. You are also going to have to live with a pretty small under cabinet refrigerator and a pretty small bathroom. I think the rear ride quality issue can be improved with suspension upgrades if that becomes an issue. Good luck. Is a pop top out of the question? Yes storage seems like it will be an issue. I was thinking of having the whole rear couch/ ottoman raised a foot off the floor and then putting big sliding storage boxes to the rear of the van. I also will have a rear box and roof rack with thule box or something similar. I'm concerned about storage but I can't come up with any alternative floorplans that work. Any ideas? Just curious, where are you located? Most people I talk to on the west coast area are more focused on cooking outdoors. Eliminating the stove/sink area could prove very beneficial to you if you are open to cooking outdoors. I do agree that all the storage you think you're going to have with any given floor plan mostly goes away when all the small bits are put in place, however, you can work around this. Have your batteries mounted under the van instead of inside where SMB often mounts them. If you won't be in cold climates have your water tank installed underneath. You already said you're going to put a roof box and rear box on it for all your big, dirty stuff to be stored. Add a rear spare carrier and then you can put a nice underfloor storage box where the spare was. 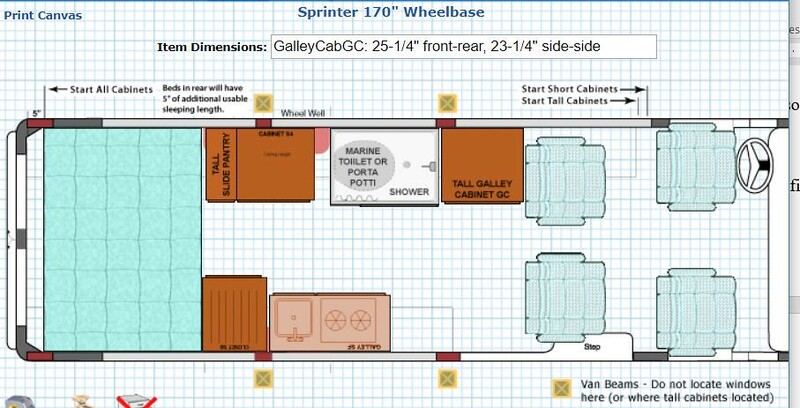 I think this will work on a Sprinter but I don't know a lot about them. Also, much storage for small things can be found inside the door cavities (once again, I've only seen it done on Fords, but I'm sure Sprinters are similar), and then you can just fine space everywhere after you take delivery. Every van I've had I have found places to store an infinite number of small items. I even geeked out enough to make a list of where stuff was on my old Sportsmobile because I had stuff packed in every crevice. This was an RB Ford that my family of four did 3-4 week trips in. It was necessary. It will probably be about the same for you. There's always this, too. Pack lighter. Most of it you won't need. If your family are the hair dryer types you may be in for a lot of arguments. Raising the couch and rear bed is a thought but I think you would probably have clearance issues then with the rear upper cabinets if you raised it high enough to gain good storage. A pop-top upper bed would solve the sleeping problem for kids but then you lose the upper cabinets and the bathroom height is compromised. Unless you have a ladder, it is pretty hard to get anything on and off the roof and then you also lose valuable roof space. The problem is that Class B's are really not made for 4 people to live comfortably. I would probably just design it properly for 2 people and have the kids sleep on the aisle floor with good cushions and sleeping bags. It would probably be money well spent to rent a Class B for a weekend and try it out. I suppose you want the 4x4 but I wouldn't be surprised if a weekend rental would convince you to look at bigger RV's. I rented a Tiger RV (4x4) once in Denver and learned a lot. That would be a reasonable vehicle to safely transport and sleep a family of four. I couldn't hardly imagine living in one though for very long with 4 people. Their prices have also gone up quite a bit. I also bet our kids would have gotten tired of that living arrangement after about age 6 or 7. We are deleting the cooktop but will keep sink and the refrigerator is also in the galley. We will have a portable propane grill. I think that we would need miss the sink if we deleted it. That is a great layout. Unfortunately I can't do a penthouse on a high roof sprinter.